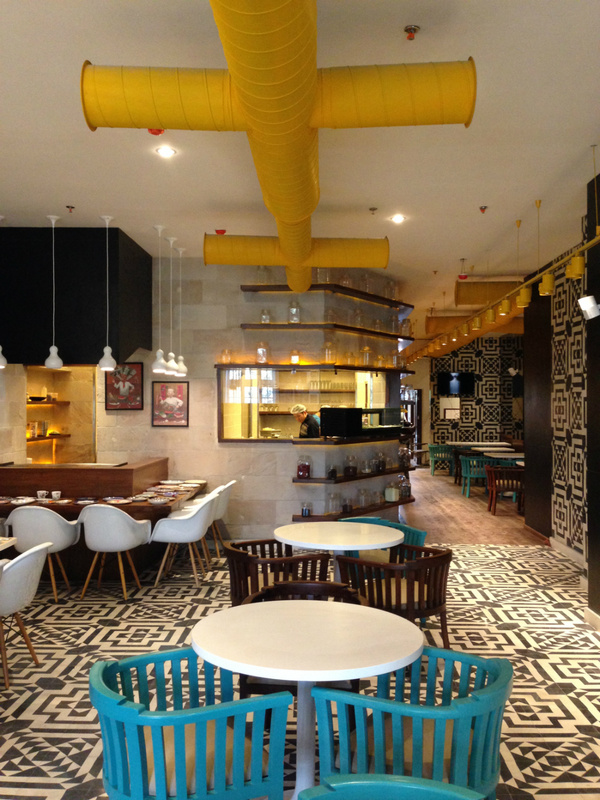 It is a pleasant surprise and joy to see bright and quirky interiors in an Asian restaurant, namely Chew Pan Asian cafe, which is such a contrast from the usual sombre and zen interiors usually associated with Asian restaurants. But the decor is just the start as the food is equally delightful and unique. Launched in January 2014, Chew Pan Asian is all about experimentation with Pan Asian cuisine. 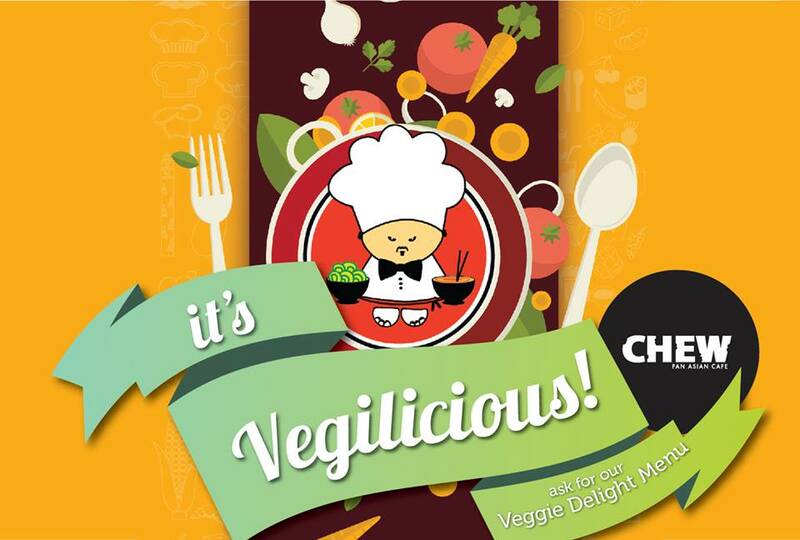 The menu boasts of Chinese , Japanese , Thai and the Indonesian Cuisine and also boasts of an open kitchen as well as a live Teppanyaki grill. Spread over 2500 sq.ft. area the interiors of the restaurant are vibrant yet comforting. Walls adorned with the eye-catching black and white Aztec-patterned tiles have been carefully contrasted with Dholpur stone. Chew is a quirky, hip and vibrant restaurant. The furniture is a mix blend of booth sofa sitting, swing seats and turquoise blue chairs that make the dining experience at Chew super comfortable and fun! 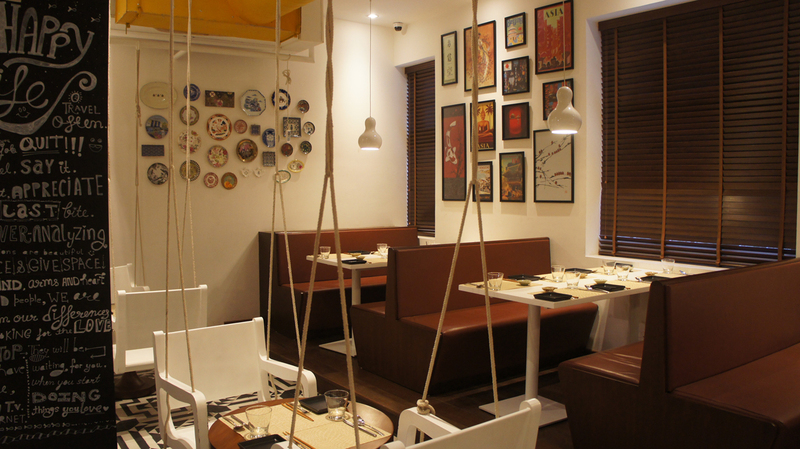 Asian inspirations within the space come in the form of carefully hand-picked ceramic plates and posters that adorn the walls and the elongated spice rack that features spices from Asia! My style pick was definitely the swing chairs which had been anchored to the floor, but as cool as they looked they also looked a bit uncomfortable, but then style before comfort I say!I also loved the wall with one liners, that included lines like “All you need is love, but also a little chocolate”, those pretty much made my day. The menu much like the decor of the place is quirky and fun. It is appealing and makes one want to actually read the menu without it seeming like an ordeal. For food, we asked the chef to get us small portions so we could try the various dishes on the menu. We started with the chew special house salad, which unlike what is expect from Asian dishes was actually not very sweet but quite fresh and light. We wanted to avoid Japanese dishes as it seems recently all we have eaten is Japanese food, so we stuck to other asian dishes. Of course the highlight was the various dumplings where they have something called crystal dumplings which i have never eaten before, but am glad I did as they were lighter than regular dumplings and we tried almost all on the menu. For mains we had Stir friend prawns and Chicken meat teriyaki with some steamed rice and some braised vegetables. We were very happy with both the service as well as the quality of our food. We ended with some Tiramisu and finger-licking chocolate molten cake. I would absolutely go back and have already recommended the venue to various people. Do try it for yourself! Posted on January 1, 2015 January 2, 2015 by AparnaPosted in Food and Beverages, ReviewsTagged asian, cuisine, decor, design, Food and Beverage, Lifestyle, review.